They say that ‘sales solve all problems’. For retirement villages speedy turnover of homes is desired by residents, families and owners. But these are challenging times with declining household prices. Every village needs more sales enquiry and conversion. We have assembled the most successful village marketers and salespeople to give you insights and skills that work. The VILLAGE SUMMIT offers exceptional value – increasing your sales rates by just 10% for most will repay the SUMMIT investment and more. 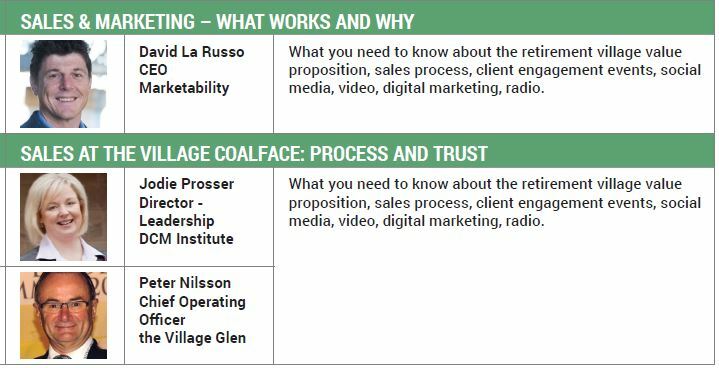 The sooner you join us at the VILLAGE SUMMIT, the sooner you can implement your new learnt sales skills. Please join us 11 – 12 April in Sydney. Check the SUMMIT out HERE.